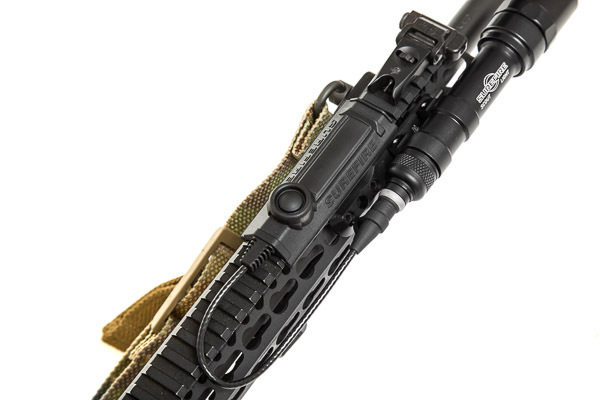 For a long time I was running a SureFire P2X Fury Defender handheld flashlight as a weapon light on my primary defense AR-15 using a Haley Strategic Partners Thorntail Keymod Offset mount. It was actually a pretty effective setup. The P2X Fury single-output LED series of lights give you 500 lumens (or 600 depending on the revision) out of a ~$130 street price. 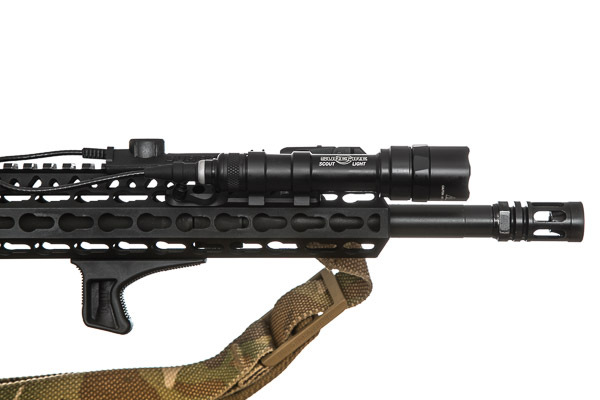 With a simple ring clamp mount for your handguard (such as the HSP Thorntail mounts), you have a very effective, budget minded setup (and even less expensive if you pick a different light). But earlier this year, I acquired a new SureFire M600 Ultra Scout Light for a good price (well below retail). The M600U gives me a 500 lumen light, just like my existing P2X Fury Defender, but in a slimmer body and the supported remote tape switch option. There are a couple of third party tape switch options which may or may not work with the P2X series. 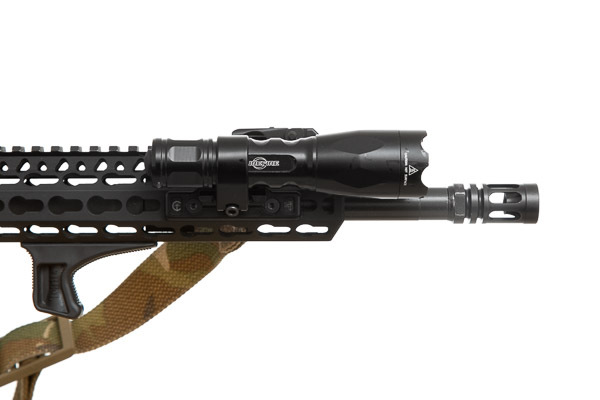 I didn’t want to have to deal with the possibility of incompatibility or instability in a tape switch for the weapon light on my primary defense rifle. I acquired a HSP Thorntail inline mount, which allowed med to utilize the 45 degree section of the Bravo Company Manufacturing KMR. The M600U + HSP Thorntail Inline makes for a slightly cleaner setup. As far as the tape switch, while I did not actually cover it in my previous SHOT Show reports, I had heard and read reports on the Unity Tactical Tactical Augmented Pressure Switch, or T.A.P.S. If you Google for this project/product, you will see a very impressive tape switch system that will directly mount Keymod, MLOK, and Picatinny. It is also supposed to be modular such that you can change out cable lengths as well. Unity Tactical had debuted T.A.P.S. at SHOT Show 2015, but it was never released. 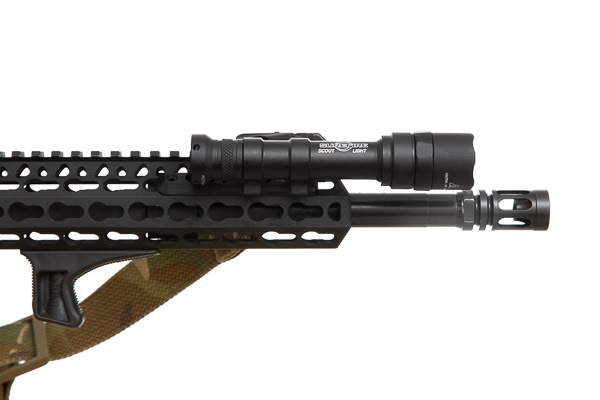 Then it was announced at SHOT Show 2016 that it would be out in February / March of 2016. Well, February and March came and went with no news of the T.A.P.S. by Unity Tactical. I tried to reach out to Unity Tactical, but got no response. So I decided to forgo the T.A.P.S. and get the SureFire SR07 tape switch and the UE tailcap to for use of the SR07 with the M600U Scout Light. A quick swap of the tailcaps, plugging in the tape switch into the tailcap socket, and snapping the tape switch onto the Picatinny rail of the KMR finished up my new weapon light setup. It’s a pretty cool setup and everything fits great as far as ergonomics and hand placement. But the one negative aspect is the length of the cable. The SR07 has a seven inch cable (hence the ’07’ in the model number). This is quite excessive and makes for the possibility of the cable getting caught or hung up on something. Unfortunately, the cable is directly molded into the tape switch, so you can’t just swap out for a shorter (or longer) cable. You are stuck with the cable you get. 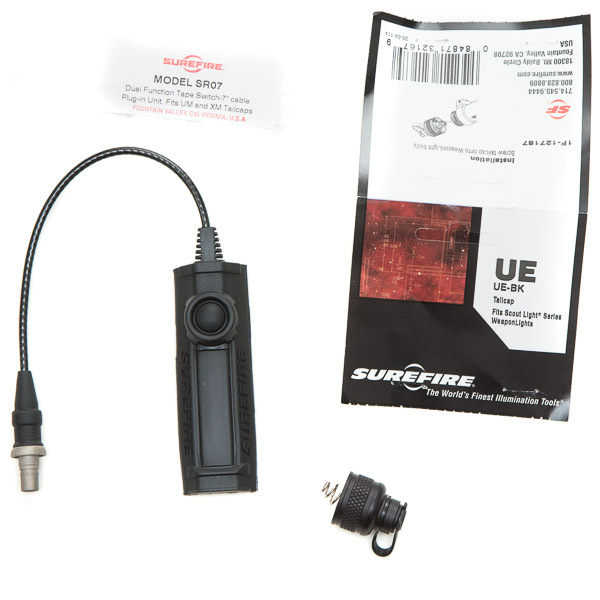 There are apparently different length cables of the SR tape switch, but SureFire doesn’t offer the option on their website for direct consumers. I assume these are custom orders and are probably special request only (e.g. Government contract). This is why I was eager to get my hands on the Unity Tactical T.A.P.S. The T.A.P.S. was supposed to have interchangeable cables. Anyway, I want to come up with a nice way to keep the table from becoming a nuisance (getting hung up on something) aside from a cable tie around the cable and a Keymod slot. But other than that, I like the new setup. As far as the SureFire P2X Fury Defender, I’m probably going to repurpose it for general carry.